You Can Call Me Moose: H2O Fun. It's vacation time here in Colorado, but here I am with my ball in Montana! 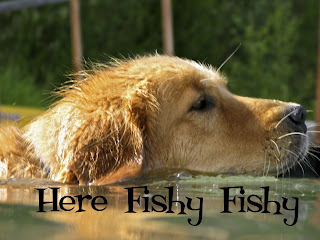 As you know, my first three years were spent in a breeding kennel.... no swimming for me. My human dad is really teaching me the ropes when it comes to water (h20). 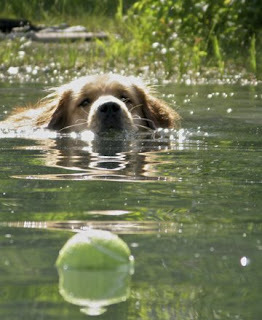 I know I should love it, but I am still a little nervous seeing my ball all by itself just floating out there. Our trip was fun to Montana and I met lots of relatives that petted me almost 24 hours a day.... my life is grand and so were they! 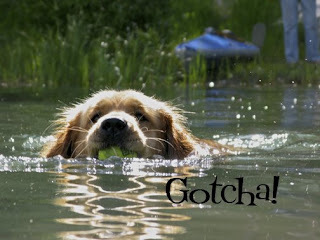 Congrats Moose, you look like your a natural swimmer, don't worry I'm still a little nervous in the water too. Good luck tomorrow in your new class!!! Looked like you had a blast! Woof! Moose. How are you? It's been a long time. It's seems that you having lots of FUN FUN!!! 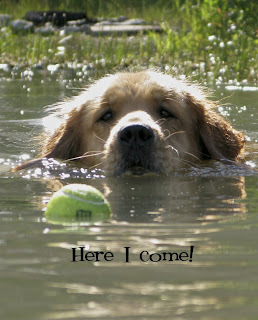 I am so jealous you get to swim.